Fall is, no doubt, our favorite season of the year. It’s when you can amp up your style in so many ways, and wear layers upon layers of gorgeous fashion pieces, especially scarves. You can get creative and experiment with so many looks, which is something you don’t really get to do — as much, during the rest of year. When we searched for bloggers for this monthly feature, we were quite overwhelmed by the number of fashion-forward fall-ready styles we had to weed through in order to make the selection. Thankfully, we managed to trim down the list to ten. Need a tip on how to wear that super chunky beige scarf? Take a cue from Aksinya of Freestyle Blog (no longer available online). Even at such a young age, this 15-year-old student blogger is already a pro at mixing and matching. Here she shows us two ways to wear the chunky extra — by sticking to a monochromatic palette while playing up the texture, or, by pairing it with a standout and slouchy sweater. Plaid, which is a classic pattern, is one of fall’s top stories. If you need a tip on how to wear it in an updated way, try this look from Valeriya Volkova. The 17-year-old blogger of The Fashion Around (no longer available online) opted to mix it with blue denim and top it with an equally bright coat. But to keep it girly (and less punk), she went for a pleated skirt instead of the usual black skinnies. Keep that black outfit from looking too boring by punctuating it with a bright chunky scarf, a la Flora Zhu, designer and author of the blog, Canvas June (no longer available online). We all know this trick is failsafe and foolproof, so why not give it a try today? Want to mix prints in the most unique and stylish way? Here’s a preppy-themed look that may give you an idea, courtesy of Spanish blogger, Priscila Betancourt of My Showroom Blog. Don’t you find it amazing how she was able to make it work? Remember that the trick to achieving a cohesive look using multiple prints or patterns is by wearing pieces that fall within the same color palette. Are you ready to take on this challenge? 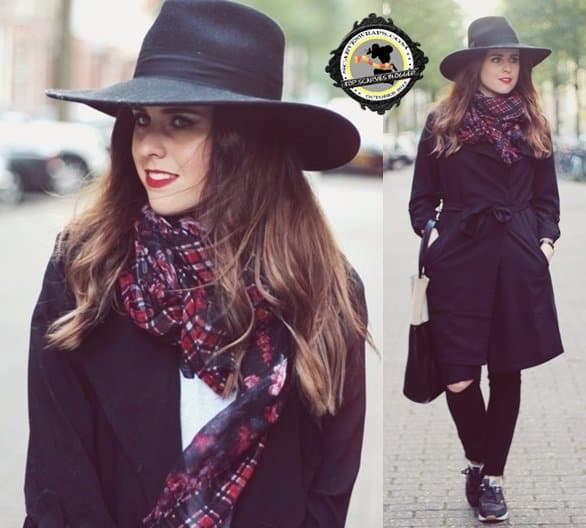 Her blog is called ‘Billie Rose’ (no longer available online), but this 25-year-old Dutch PR consultant and fashion connoisseur goes by the name of Rosanna. The laid-back way she styled her mixed-print (floral-on-tartan) scarf was what caught our attention. We like how she kept it casual and sporty, yet polished at the same time. 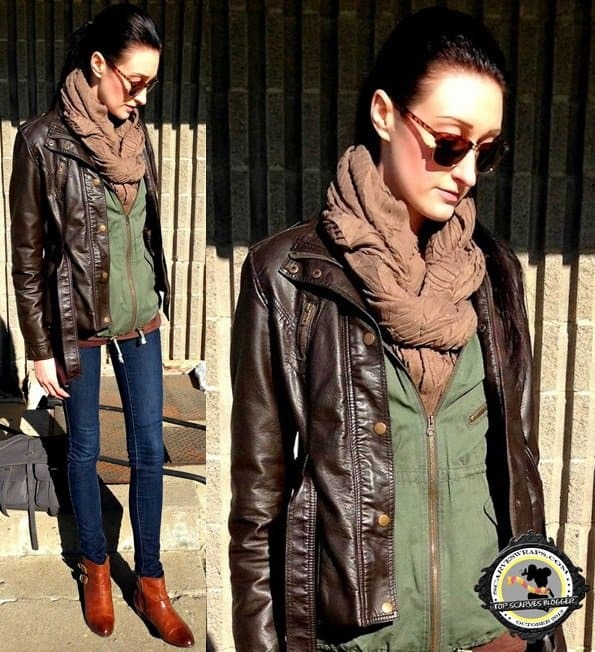 We love the tough yet feminine vibe we’re getting from Roza’s look below. The 18-year-old Bijoch blogger gave her chunky maroon scarf a different spin by pairing it with a silky floral blouse and black leather skinnies. The juxtaposition looks very intriguing, don’t you think? 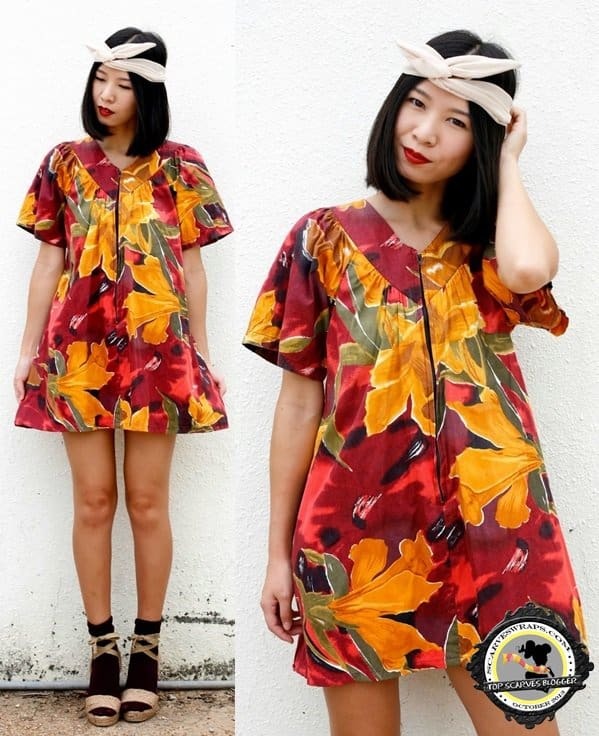 Sure, this quirky outfit from Twee Wu of Ezzentric Blog may not exactly be what you’d call fall-appropriate, but we couldn’t resist featuring it here today. We love the super cute way she styled her catchy dress with a headscarf. The add-on really made a big difference, don’t you think? If you didn’t know it, you’d think Tiffany of Sky High Dech (no longer available online) was a supermodel. Not only is she super-slim, but she’s also 6-feet tall. She has mentioned in her blog that she finds it hard to find clothes that fit right, but judging from the super chic outfit she put together below, you’d hardly think so. Doesn’t she look awesome here? Want to keep your bright scarf extra interesting? Coordinate it with matching pants a la Chantal of Likeabyul (no longer available online). You can also elevate your look even further by adding a little bit of texture — such as leather, much like the way this 19-year-old Parisian styled her outfit. Talk about being a chameleon. Natalie Pirmann, who authors Fashion Fascination (no longer available online), is definitely a pro at styling. After all, it is the 24-year-old’s profession. Here you can steal two different looks from her — one is very “English” and sports the tartan scarf with other Saville Row patterns, while the other shows the leopard print extra elevating a laid-back street style very reminiscent of a fashionable New Yorker. Which outfit would you copy?